A fresh collection of Production Tools. Re-Zone tracks have been released on Toolroom Records, Black Hole Recordings, 1605, Baroque, Be Yourself Music, Stereo Productions, Whoop, and has been supported recently by Pete Tong, Carl Cox, Mark Knight, Roger Sanchez, Axwell, Tiesto, and Sasha. This collection of new and exciting sounds includes Bass, Drums, Synths, One Shots, FX and Drum Kits - and is inspired by artists including Swedish House Mafia, Jorome Isma-Ae, Daniel Portman, Axwell, Afrojack and Dada Life - plus labels that include Spinnin, Toolroom, Anjunadeep, Axtone and Doorn. ,Including Huge Builds and Breakdowns, FX Risers, Delays, Ibiza style Riffs, Tech Noise, Glitched Subliminal Basses and Powerful Synths. There are 210 Loops at 128 BPM, plus 830 Single Shot samples which you can use to program your own compositions. Also included are a huge collection of 178 ready to play patches for Halion, Reason NNXt, Kontakt, EXS and SFZ compatible soft synths. 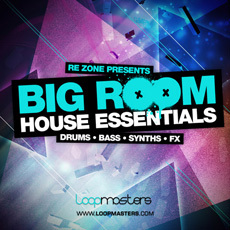 In detail Re Zone's Big Room House Essentials sample pack includes 29 Bass Loops, 147 Drum Loops, 34 Synth loops, 124 Bass Samples, 41 FX, a massive 630 House Drum Samples, plus 34 One Shot Synths.